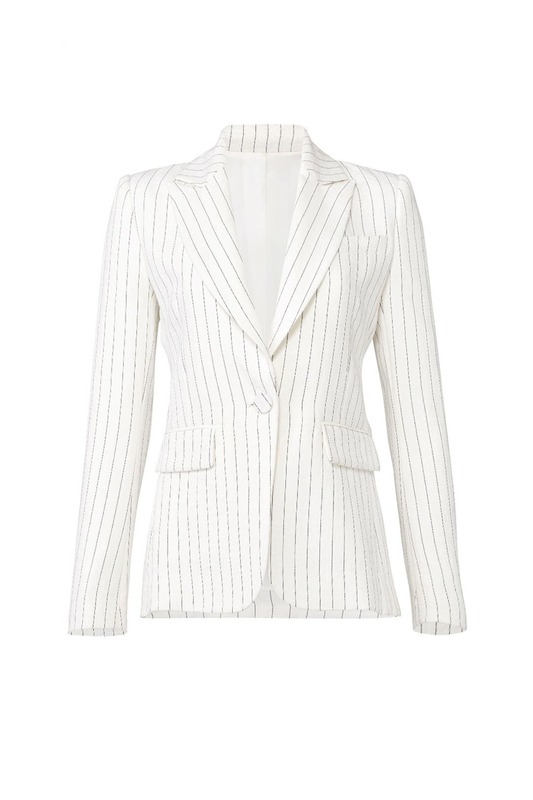 Pinstripes and strong shoulders define this one-button blazer by Rachel Zoe crafted to be a the perfect spring layer. Ivory striped cotton (100% Cotton). Blazer. Long sleeves. Exposed front button closure. Fully lined. 27" from shoulder to hemline. Imported. Super narrow fit through the arms and shoulders, no stretch. This was ok for me- the only problem was that the sleeves came down to my knuckles. Blazers in a regular 2 are usually perfect or a little short in the sleeves for me. This is definitely cut like a Tall. Nice jacket, smartened up a basic t-shirt. I felt it was a little tight in the upper arms, so if you lift weights like I do, size up. I wore it with my usual office outfit of jeans, but this would literally go with anything. The lining makes it fit well (this is very important to me) but it does make the jacket a little warm. I wear a suited look to work, so this didn't work for me. It's more of a casual blazer. Runs large even thought reviews said the arms were tight. I wear a 6 or 8 and the 8 is too big for me. This would however be super cute with a black dress or a casual event where you needed something to throw over to stay warm. Just not for the office. I sized up but should not have. It's an easy, lightweight summer blazer. Mine had a boxy / boyfriend look but had I received my correct size it would have had a nice fit. Beautiful blazer. Buttons a bit loose but otherwise perfect. Silky lining feels amazing. Size up for this elegant piece. The color is a nice oyster off-white. The lining is silk. I wore it open because it was a little too small. The arms were tight too. Lightweight woven fabric, but the lining made it quite warm on a summer night. Looked best with jeans. Reasonably flattering - not too boxy or oversized. I liked it! Lovely light-weight jacket perfect for the office in summer. I wore the small and it was a bit oversized but still stylish - the extra-small would have been more tailored. Too small for wide, athletic shoulders. Great fit and material. A perfect work jacket. 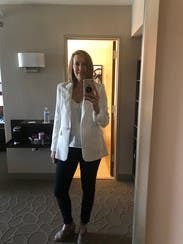 Great classic white blazer. The thin stripes make it interesting and I got a lot of compliments. The arms were a little tight, but I have that problem often. Size down. I'm usually a 4-6 so I rented the 4 and it was very large. I'm right at the edge of petite and the arms were a couple inches too long. Just too loose to look professional. Looked like I was a kid trying on mom's coat. Sharp looking blazer...classic and clean. It fit well "almost" everywhere. It was a little snug at my biceps but I was able to wear it still. Loved the fit, feel and versatility! I dress modest so I paired this with the Tina Turk Orange Marisa Jumpsuit. It definitely gave it a classy look. You can dress it up for work or dress it down. It would look great with a pair of jeans and a fitted black turtleneck or t-shirt. It's very well made. I would definitely rent it again! Fit like a glove. Super cute for work or weekends. 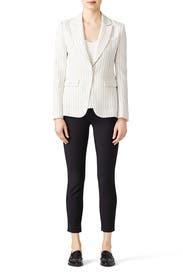 Would buy this blazer! Great fit and a white blazer always stands out in a good way! It was way to tight in the arms and shoulders. I wish there was two buttons but I loved the longer cut at the waist. This was a bit beat up... the material was more casual than I expected. Too small to wear-5)3 muscle and upper arm were a size 8!! Too bad as the look was good! This jacket has a really nice fit. It's a bit wrinkled and would need to be steamed due to the fabric but overall really good look. Nice stripe for summer. 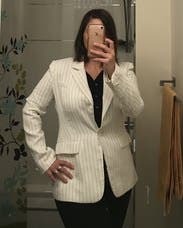 Runs very large though and is very structured - lapels were a little too much for me and it hit below my hips (though I am on the short side) so I did not wear it. The blazer can be easily dressed up or down. I rented this in a size 0 but could not wear it. It has shoulder pads and I looked like I was swimming in it. I also didn't love the fabric - it didn't feel as "nice" as I would have hoped. Unfortunately the arms are too long for me and overall fit was a tad too big. I agree with other reviewers about the arms being narrow. But overall fit was true to size and this can be worn with many options. I may buy this jacket. I was unable to wear this because although the main portion of the jacket fit, I couldn't even get my arms into the sleeves. I liked the stripes, style and the fabric. The fabric is of good quality with little to no stretch. Too small in the arms. Very classy and pretty but arms too tight and therefore uncomfortable. I sized up per the recommendation of other reviewers and wore a 6. It was a roomy fit, but not overly. The cream color and gray-blue pinstripe were lovely in person and more subtle than they look in the photo - I really liked this. It is not just cream with a black stripe. The light linen blend material has a nice drape but wrinkles very, very easily. I would have wanted to keep it, except that the collar had too much material for me, and tended to fold outward horizontally in the front. I wore this to a work event with black skinny jeans and it really dressed it up while looking very hip. Loved the fit and fabric. Fit well and like the picture. However, ALL the pockets are sewn shut! Even the breast pocket. We deserve real pockets. 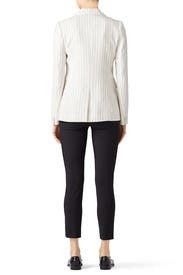 I really liked the look of this with black pants and heels. the sleeves were a bit tight, but other than that I loved the fit. The material was a bit more summer weight than I expected, but it still looked sharp for work. The fabric is lighter which was nice.